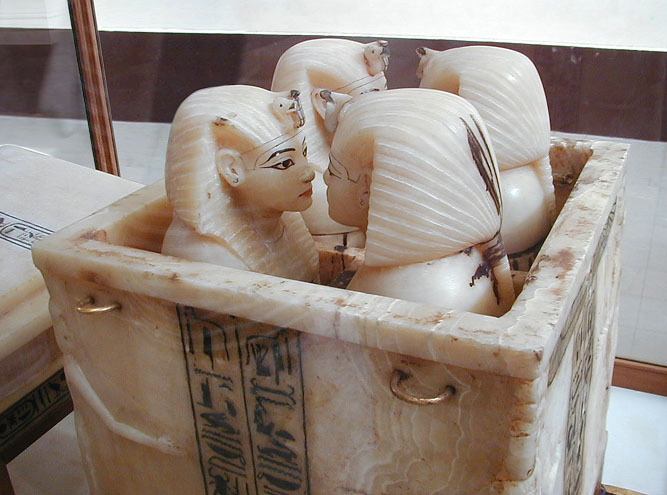 Sometime in the winter of 1907 and 1908, an American researcher found a curious assortment of objects lying in a small pit in the Valley of the Kings. Theodore Davis, like many Egyptologists of the day, was looking for large, grand things, preferably royal tombs. So when he and his workers dug up several jars filled with linen bandages, worn kerchiefs, broken pottery, splintered animal bones, bits of dried mud, and collars made of faded dried flowers, he immediately set them aside and resumed digging. While I was at the Bowers Museum in California this past weekend giving a talk on mummies, Peter Keller called me into his office to take a gander at something remarkable. Keller is the director of the Bowers Museum in Santa Ana, California, and the man who succeeded in bringing the very famous Tarim Basin mummies and their associated artifacts to North America for the exhibition, Secrets of the Silk Road: The Mystery Mummies of China. 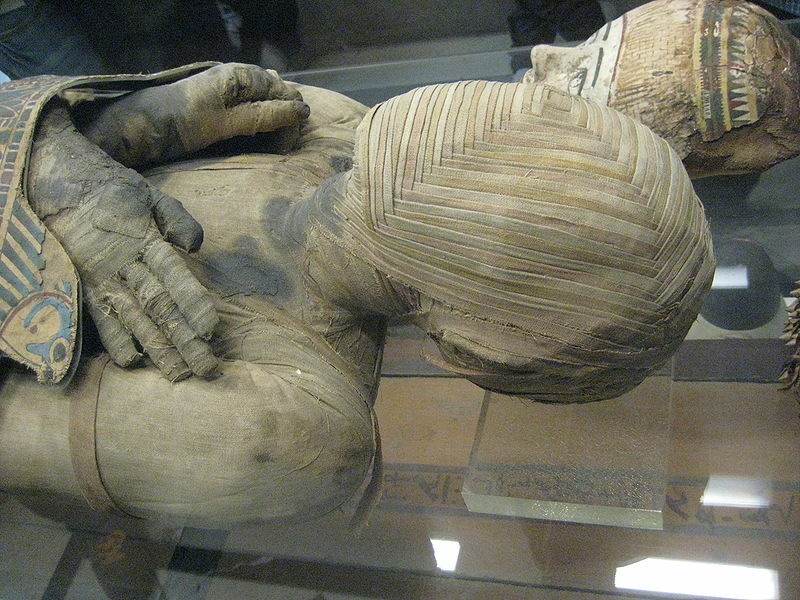 These European looking mummies, some as old as 4000 years, have never travelled outside Asia. Keller had just located the earliest known necropolis in the Tarim Basin, the site known in English as Small River Cemetery No. 5 and in Mandarin as Xiaohe, on Google Earth. And the two of us spent a good half hour or so examining the area with researcher Victor Mair. This made a great impression on me. The Tarim Basin lies at the very heart of Asia, nearly encircled by steep snow-capped mountains. It is an exceptionally harsh, forbidding land. In summer, temperatures there can soar as high as 125 degrees Fahrenheit; in winter, they plummet to minus 40. And it is one of the most arid places on Earth, right up there with the Atacama Desert. For all these reasons, modern humans took their time settling the Tarim Basin. Indeed Victor Mair, the sinologist at the University of Pennsylvania who has studied these mummies for nearly twenty years, suggests that the Tarim Basin was the last place on Earth to be colonized by humans. And this didn’t happen until some 4000 years ago. In the reign of Mao Tse-tung, the Chinese government put all this harshness to work. It constructed labor camps in the Tarim Basin, knowing that the desert would be a powerful deterrent to escape. And it built a nuclear testing range there, confident that no one would dream of crossing the barrens to spy. It is one thing to know all this intellectually. It is quite another to see all the desolation of the Tarim Basin on Google Earth. Small River Cemetery No. 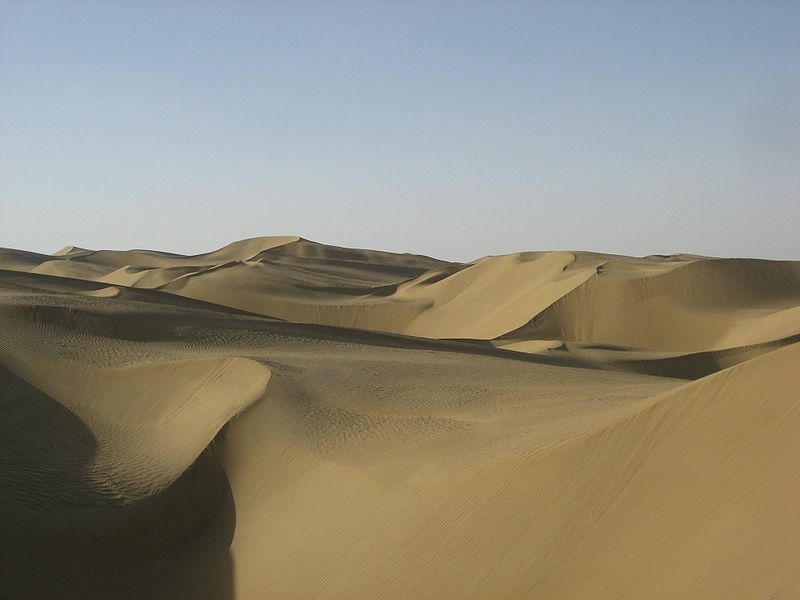 5, named for a stream that no longer exists, is surrounded by miles and miles of sand dunes, dried river and stream beds, and pure nothingness. If you’d like to see for yourself what I’m talking about, here are the coordinates: 40 degrees, 20 minutes, 11 seconds North and 88 degrees, 40 minutes and 20.3 seconds East. (And if anyone knows how I can embed the Google Earth photo of the site in this blog, please leave a comment below.) I can give you these coordinates without any fear of encouraging looting, as Chinese archaeologists have now completely excavated Small River Cemetery No. 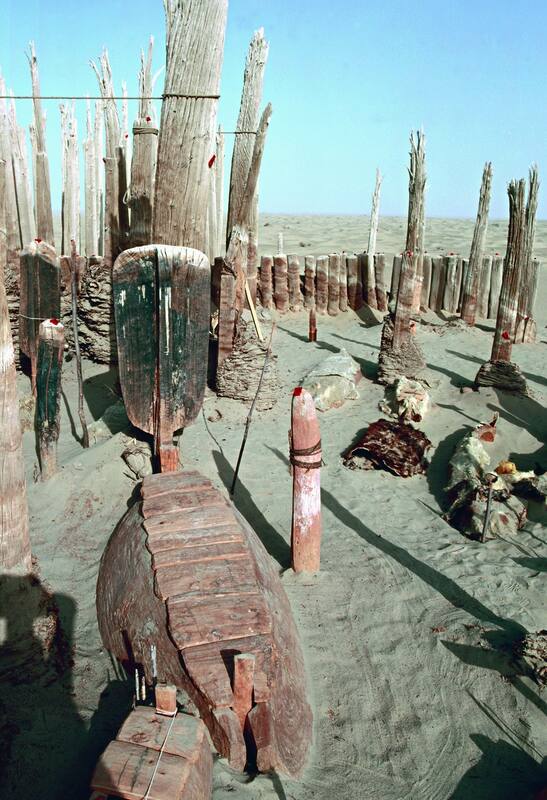 5, and reconstructed the site, with its remarkable phallic looking wooden posts. Surveying the area via Google Earth has given me a whole new appreciation for the Bronze -Age Europeans and Asians who colonized this region some 4000 years ago. Mair believes that water would have flowed then along many of the small streambeds that meander through the desert. I’m sure he’s right: how else could the colonists have survived there? But life must have been a daily grind in the Tarim Basin, and I often wonder if the early migrants didn’t drift off to sleep each night dreaming of their greener and gentler homelands. I have just returned from a three-day trip to California, where I attended the opening of a major new exhibit on the Tarim Basin mummies. The new exhibition at the Bowers Museum in Santa Ana did not disappoint. I spent hours marvelling at the mummies and nearly 150 spectacular artifacts which date as early as the Bronze Age, 4000 years ago. I’ll be writing about some of the more fascinating aspects of the exhibit this week. But today, I’ve posted an entry over at Archaeology magazine on the sartorial splendor –no other way to describe it–of one of the mummies, Yingpan Man. Please click here to read today’s post. On the weekend, British researchers published an intriguing article in Lancet on a group of people whose cravings for fat-saturated junk food led to arteries packed with plaque. The individuals in question weren’t 21st century Brits fatally fond of crisps, chips and deep-fried Mars bars, however. They were ancient Egyptian priests who had regularly scarfed up left-over cakes and other offerings given by supplicants. Rosalie David, an Egyptologist at the University of Manchester and one of the world’s great experts on Egyptian mummies, headed the team. 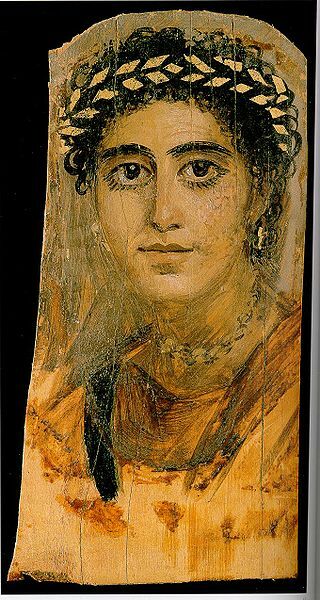 She and her colleagues examined mummies of Egyptian priests and their family members and discovered to their surprise signs of serious heart disease, including badly clogged and damaged arteries. Intrigued by this, David studied inscriptions on Egyptian temples describing the rituals that priests performed and the offerings that supplicants left. High on the list of the offerings were cooked geese, whose meat contained up to 60 percent fat, beef, and an assortment of calorie-laden cakes made of animal fat and oil. Moreover, the inscriptions and other texts revealed how priestly foodies at these temples refused to let all this fat-rich fare go to waste. After performing rituals with their offerings three times daily, they gathered up the leftovers and took them home to their families–hardly a heart-smart diet. David and her colleagues now suggest that this fat-saturated diet and the arterial diseases that resulted could have cut short the lives of these priests. Studies of the mummies and other human remains suggest that this group did not often live past the age of 50. 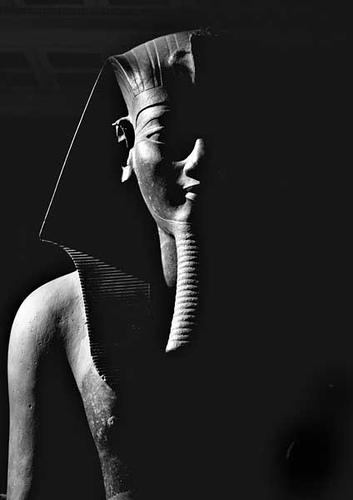 We never think of ancient Egyptians keeling over from heart attacks or strokes. Those are supposed to be modern diseases, but it would appear that there really is nothing new under the sun. 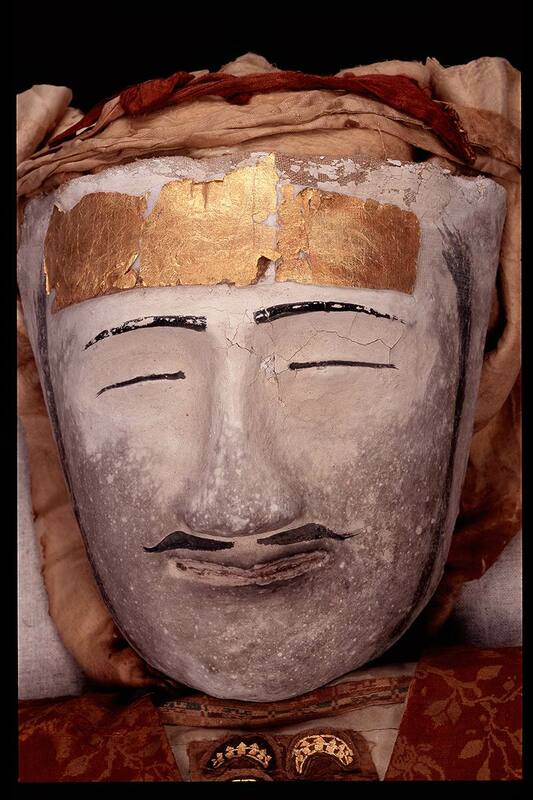 If you ask me, these exhumations and studies of ancient kings and other celebrities are becoming media circuses. All the high-tech poking and prodding quickly strips away the dignity and grandeur of great men and women, baring their physical frailties and secrets for all to see. In recent years, we’ve been subjected to several of these tawdry sideshows and I suspect there are more to come. I posted recently on the proposal to exhume Leonardo da Vinci. And two weeks ago, I spotted an article on a Danish team who will soon exhume a famous 17th century astronomer, Tycho Brahe. None of the subjects, I might add, has given consent for such scientific study. And I sometimes wonder about the motives of the researchers. The scientists who propose to exhume Tycho Brahe, for example, want to determine whether the famous astonomer was murdered or whether he died of natural cause. This hardly seems reason enough to rifle through a tomb and disturb the sleep of the astonomer. In future, I’d like to see researchers and reporters alike treat the ancient dead in the same way we treat the recently deceased–with respect and decorum. Few of us would consider prying open a recent grave and poring over newly buried remains just to satisfy a point of idle curiosity. So why is it ok to do that to a 17th century astronomer? When I was writing my book, The Mummy Congress, I was really struck by the highly professional way that serious mummy researchers treated the ancient dead. They never made jokes at the expense of the dead or talked lightly or unfeelingly about their ailments. Indeed, during the examinations of the bodies, they often spoke as if the mummies themselves could hear exactly what was said. Poor Tutankhamun. I’m glad he couldn’t hear what people were saying today. For the last few days I have been reading a superb book about a harrowing journey that 26 undocumented Mexican migrants took in May 2001 across the Sonora Desert in hopes of reaching Arizona, and last night it got me thinking, strangely enough, about soma, an ancient intoxicating ritual drink mentioned frequently in the Vedas and other sacred texts in Iran. What’s the connection? Well, bear with me. I think you’ll find this interesting. The mention of ephedra really caught my attention. 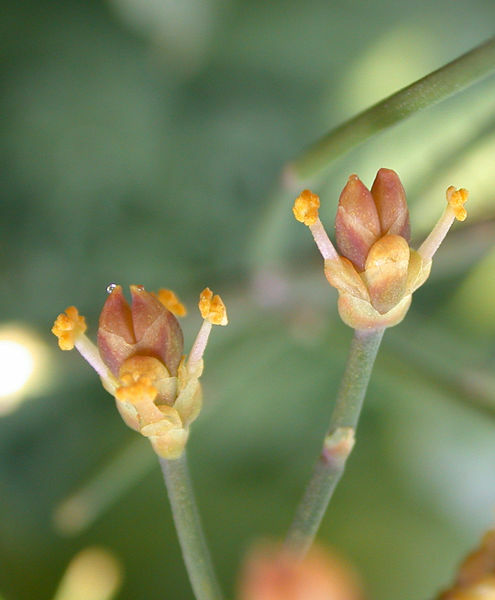 There are several species in the genus Ephedra, but they are all unprepossessing, shrubby, desert-loving plants and several species contain an important stimulant– ephedrine–that produces an adrenaline-like rush in strong doses, and, in some reported cases, a state of hallucination. 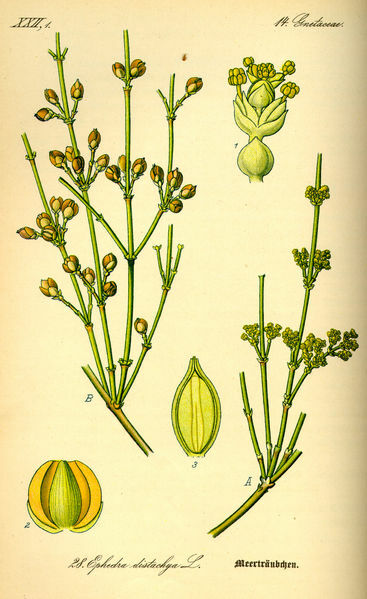 I have been reading a lot in recent weeks about ephedra, for these plants are found in lavish quantities in the 4000-year-old graves of Bronze-Age mummies in the deserts of China’s remote Tarim Basin. 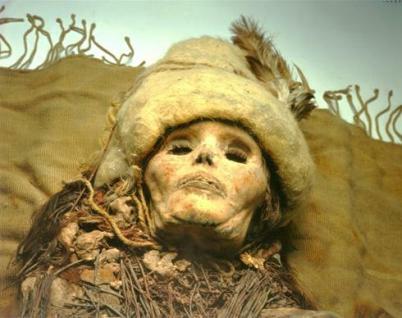 As some of you will know, the Tarim Basin mummies are very famous and controversial, largely because they are European in appearance and in the technology they possessed. (Think plaid woolen clothes.) As such, they clearly indicate contact between East and West far earlier than previously believed. Now here’s the thing. The fact that archaeologists have uncovered so much ephedra in these graves suggests that it served a very important ritual purpose, most likely to spur on the spirit of the deceased as it took the long, dangerous journey to the next world. Could the Bronze-Age inhabitants of the Tarim Basin have brought knowledge of ephedra from lands to the west, such as Iran? And could ephedra have been one of the plants used to brew soma, the sacred drink that ancient priests and others imbibed in order to journey to the other world? Two American researchers, David Stophlet Flattery and Martin Schwarz, lay out in minute detail the available scientific evidence for soma in their 1989 book, Haoma and Harmaline: The Botanical Identity of the Indo-Iranian Sacred Hallocinogen. Researchers have long debated possible ingredients. But after detailed study, Flattery and Schwarz concluded that ephedra was one of the key ingredients in the fabled drink. There are dissenters and doubters of course. But I think there is something very poignant here. Illegal Mexican migrants swallow ephedrine pills by the handful today in order to get to a place they think of as the promised land. But the ephedrine does them no good at all. Each year, the American border patrol finds hundreds of their bodies lying out in desert. Too bad Levin didn’t ask a few hard questions about exactly where all these Chinese antiquities are coming from. If he had, he might have come away with a very different impression. While researching a new story for Archaeology magazine, I recently discussed with Victor Mair, a Sinologist at the University of Pennsylvania in Philadelphia, and one of the world’s leading experts on the archaeology of Xinjiang province, this very issue. 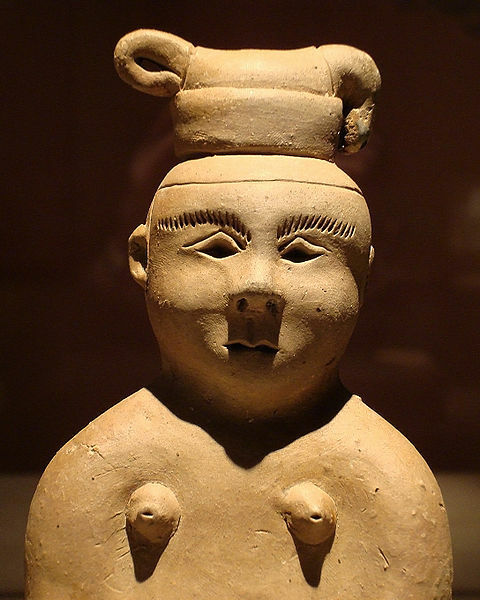 I had noticed in Mair’s articles that many of the most important Bronze Age and Iron Age sites in Xinjiang–sites that have yielded European-looking mummies and western grave goods and that are now revolutionizing our understanding of Central Asian history–had been badly looted. In fact, looting in Xinjiang has become so serious that Chinese archaeologists are constantly forced to excavate entire cemeteries just to salvage and protect some of the finds. To me, this is the real story behind the newfound enthusiasm for antiquities in China. And there is a terrible irony here. During the Cultural Revolution, Mao Zedong ordered the destruction of “old culture,” officially condoning the looting of old cemeteries and destroying antiquities. Now the pendulum has swung wildly in the other direction, as the Chinese middle class celebrates its ancient culture. But the change in attitude has only led to further destruction of the archaeological record.